Please note we do not run birthday parties in July and August. Have your next birthday party at the High Park Nature Centre, and learn about nature in a fun, interactive way! Nature Centre parties are intimate celebrations for up to 15 kids. 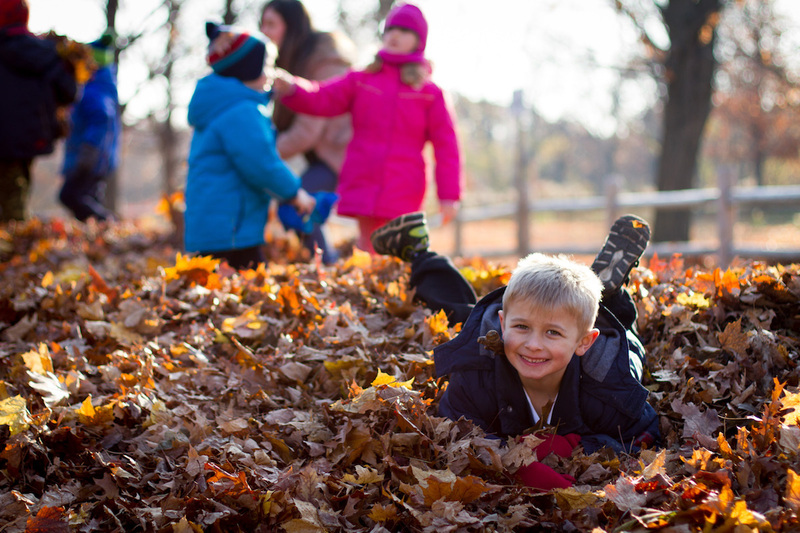 Make nature-themed crafts, play games, and explore High Park. A party with a maximum of 15 kids and 10 adults. This option works well for older kids. A great option for younger guests whose parents want to join. The maximum number of children is 10; maximum number of adults is 15. The ratio of adults to children can change, as long as there are no more than 15 children and no more than 25 people in total. *Please note that children under 4 may be invited to the party, but need to be accompanied/supervised by an adult. Starting September 2018, our birthday parties will be held at 440 Parkside Drive - the HPNC Cottage. This building is small and intimate- perfect for birthday parties! If you are ordering pizza, we recommend that you set the delivery time to 15 minutes before the time you would like to eat it, as the HPNC Cottage can be difficult to find and you may need to give directions to the delivery person. Our birthday parties are held at 440 Parkside Drive (the HPNC Cottage). This building is small and intimate - perfect for birthday parties! 10:00-10:30 am: Birthday guest of honour and parents/guardians arrive to set up for the party. 10:30-10:45 am: The instructor will have an introductory activity for guests as they arrive. 10:45-11:15 am: The instructor will introduce the theme of the day through pictures, songs, and/or a craft. 11:15 am-12:15 pm: The instructor will lead a nature hike into High Park. 12:15-1:00 pm: Open time for the birthday host! All guests will be back at the Nature Centre for cake, presents, or whatever the host would like. 1:00-1:15 pm: Clean-up and time to go home. The instructor will handle the dishes and cleaning up the Nature Centre, so the party hosts just need to gather their things together to bring home. 2:30-3:00 pm: Birthday guest of honour and parents/guardians arrive to set up for the party. 3:00-3:15 pm: The instructor will have an introductory activity for guests as they arrive. 3:15-3:45 pm: The instructor will introduce the theme of the day through pictures, songs, and/or a craft. 3:45-4:45 pm: The instructor will lead a nature hike into High Park. 4:45-5:30 pm: Open time for the birthday host! All guests will be back at the Nature Centre for cake, presents, or whatever the host would like. 5:30-5:45 pm: Clean-up and time to go home. The instructor will handle the dishes and cleaning up the Nature Centre, so the party hosts just need to gather their things together to bring home. Themes can be adapted for any age group. 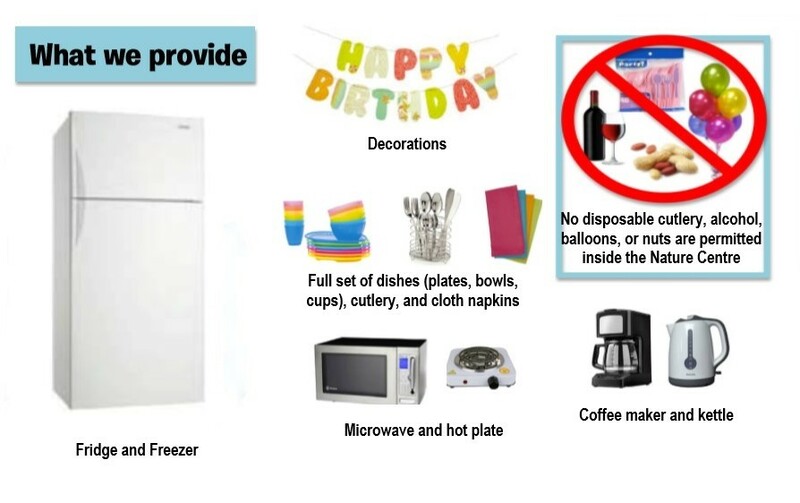 Birthday party activities within the theme are personalized based on weather conditions, season, and age of children attending the party, and may or may not include example activities given below. If there are specific activities you would like us to do that are within the parameters of the theme, just let us know! Act, sing, build- explore nature through art! Create your own art while exploring the beauty of High Park. Look for patterns in nature, learn animal calls, design a nature sculpture, and more! Get grossed out, amazed and stumped by weird and wonderful animal adaptations! This party is all about the animals that live in High Park. Discover the neat things that they do and eat, visit interesting animal homes, and play games on a nature hike. Happy Bird-day! Create a pine cone bird feeder and hike in search of a flock of chickadees, nuthatches and woodpeckers. Try to hand-feed chickadees and learn how these amazing birds survive the cold in High Park. Go on a birthday bug hunt! Explore the amazing adaptions of one of High Park’s tiniest animals. Craft your own insect to take home, examine insect specimens at the Nature Centre and then go on an insect scavenger hunt with a net and collection jar! Discover the amazing reptiles and amphibians that live in High Park! Search for turtles, salamanders and frogs in High Park’s Retention Ponds and wetlands. Learn about some of their amazing survival adaptions through fun games. Learn about the plant and animal superheroes that live in High Park, and how you can become a superhero yourself! Play games to get to know the superheroes of High Park! Enjoy a birthday hike along trails carpeted with beautiful fall leaves. Search for chipmunks and squirrels and learn about the amazing ways that animals and plants prepare for the winter. Discover the excitement of winter! Winter Adventurers will learn why we love winter so much. Play in the snow, slide on the ice and play winter games! This party can happen with or without snow cover. All birthday parties are held at the HPNC Cottage, located at 440 Parkside Drive. All Birthday Party bookings require a $150 deposit. We charge a $10.00 administrative fee for date changes. We cannot hold a day and time without a deposit. Your deposit does two things. It holds your date and time and covers any damage to the Nature Centre or NC property during the party. Should no damage occur, the deposit will be used to pay part of the balance of the party fee. Should damage occur, your deposit will be used to pay for repairs and additional charges may apply, depending on the extent of the damage. The balance of the total fee for your party is due after the party. We will send you a link with how to pay online. If cancelled with at least 21 days’ notice of booked party date, a $20 administration fee will be charged and the rest of your deposit will be returned. For all late cancellations and no-shows, your deposit will not be refunded. To book a party you will need to fill out a contract and pay the $150 deposit. We cannot hold dates without a contract and deposit. Bookings must be finalized and confirmed 3 weeks prior to the party date. Please note that the Nature Centre is not available for rentals without guided programming.